Precision-shaped spruce! Quartersawn braces with bottom curvature for Dreadnought. Accurately shaped and sanded by machine to save you hours of work. The soundboard braces are accurately shaped to a 28-foot radius. The subtle curves and tapers are already there. The back brace set has a 20-foot radius and includes five flat cross-grain spruce center strips. 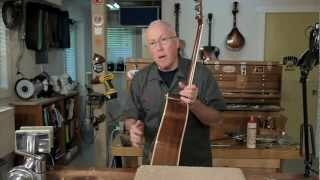 This issue of Trade Secrets is a video: Dan Erlewine glues a Martin back brace, using Scissor Jacks along with tools you can make in your own shop. After this video, we developed the Brace Gluing Wedge to simplify this job and reduce the number of tools needed. Banjo Killer? The scoop on forward X bracing for greater guitar volume. Todd Sams gives a simple and clear explanation of how to position dreadnought braces for the sound and volume of an early-30s Martin. I haven't actually used them yet but I'm sure they'll save a lot of time cutting shaping. One thing though, it would be nice if they had left it square where the x-braces cross in order to make a good joint. I love these braces.I do an occasional LG0-1 conversion to x bracing as an LG2.They are beautifully made and shaped. I have used these braces in all my guitars and found them to be of excellent quality and a real time saver. Highly recommended. By Aaronwho from L-ville Ga. Very nice and accurate design reproduction. I love these braces. They save a lot of time and even a few mistakes from time to time. They are a great start to making a soundboard sound great. A little pricey though but if you don't have the equipment to make them with proper radiuses, they're priceless. In the early stages of building my first guitar, and the back seam split open as the rosewood dried. Stwemac was very good about replacing the back and back braces that had to be cut to cut a new back joint. Getting good feelings about tech support. You can have a conversation with them and they’ll work to make sure you’re successful. There were parts missing in my order but the problem was corrected in "record time." Quality product. Well shaped. Especially liked the back bracing with precise curves. Would like the tone bars to be a bit longer to allow for shaping. All in all it's a nice time saver as I've gotten all I can out of the self carving experience.